The year was 1986. The singer was only twenty-two, but since childhood she had been captivated by the worlds of wonder and imagination that she discovered in fantasy and science fiction. Later, she would become a John W. Campbell award-winning writer of science fiction stories and novels, but for now she poured all her imagination and creativity into crafting songs that combined haunting beauty with a sweeping narrative style. 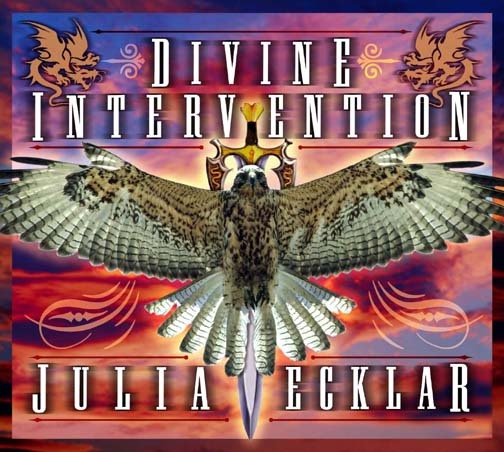 The result was Divine Intervention, an album that shattered the boundaries of science fiction and music with delicate orchestral and pulse-pounding rock settings of Julia Ecklar's song-stories. This long-awaited remastered edition of Divine Intervention combines the original album tracks — polished and re-mastered under the supervision of producer Michael Moricz — plus fourteen minutes of new and previously unavailable tracks. We've received piles of fan mail for this project. If you are a fan of Julia Ecklar's books or music, this album is a must-have! Please note: this album is MP3 (download)-only. All 2200 CDs are now sold out. "The music still runs through my head at odd moments, and some of it I can sing." "How come such a gifted writer also gets to have such a beautiful voice? Wonderful songs and great backup in a brilliantly produced album."